Many people in animal welfare have seen other communities have success with innovative pet adoption promotions including fee-waived or reduced-fee adoptions, and would like to try implementing them in their city. Sometimes that’s as simple as announcing a promotion, but municipal shelters may find political and administrative policymakers aren’t easily brought on board. Jeannette Peters of Nonprofit Management Consulting, LLC, in Gainesville, FL, is an organizational development specialist working with a wide variety of community-based programs throughout the United States to improve effectiveness and performance. For the last 15 years, she’s been working with a coalition of animal welfare organizations in the Gainesville area, which is currently on track to achieve a 93 percent live release rate community-wide for 2017. As part of her work in Alachua County, Peters spearheaded local participation in a series of fee-waived pet adoption events supported by Maddie’s Fund® over the period from 2010-2014. 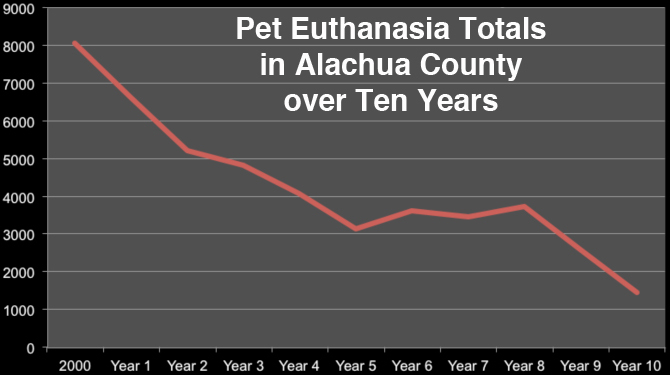 One of the organizations in the coalition is Alachua County Animal Services (ACAS), the local municipal shelter. ACAS wanted to participate in the fee-waived adoption events, but it had been a long-standing policy at the shelter to require full-fee adoptions for almost all pets. The rationale from the county’s budget and accounting department was that the animals were being counted as “assets” that could not just be given away. The coalition team met with county officials to see if they could change their minds and policies regarding free adoptions. They carefully selected the representatives most likely to be heard by policymakers: Dr. Julie Levy, a professor at the UF College of Veterinary Medicine in Gainesville, and a renowned research scientist; and Gladys Cofrin, a prominent local philanthropist and animal advocate whose family has funded museums, parks and major projects in the community. While Peters and other advocates knew there were many areas where policymakers could improve the animal welfare system, for this project they focused on a single, specific request of commissioners that did not require any county funding at all: to support adoption fee flexibility and give the Animal Services Director authority to try different fee-based strategies to increase lifesaving at ACAS. Most importantly, they approached each commissioner in a respectful, non-confrontational manner and calmly acknowledged their objections and concerns. “We met individually with each of the five commissioners, tailoring our presentation to what we knew about the interests and preferences of each,” Peters said. “We were ready for questions and conversations about side issues that had the potential to distract from the discussion and derail our request. The outcomes to their efforts appeared quickly. Within a week of the visits, the commissioners were quoting their statistics and research in public county meetings to support their direction to county staff to implement fee flexibility. The Animal Services Director was given immediate authority to implement fee-based strategies, and his staff began planning reduced-fee adoption promotions the same week. 1. Put in the time to educate and team-build. Don’t expect policymakers to immediately understand and sign onto your position. In fact, assume they won’t and plan accordingly. 2. Find a prominent and respected spokesperson. The door-opening power of a well-known local philanthropist cannot be overstated. 3. Bring something to the table. Show how endorsement of your position can benefit the entire community. 4. Always be respectful and non-confrontational. This is the time to activate your team’s statisticians and quiet persuaders. Those who are too passionate to restrain their emotions can actually hurt your cause. 5. Keep their priorities in mind. Acknowledge that policymakers have an overwhelming list of community concerns to address, and that animal welfare issues simply can’t always be on the top of their list. Stay involved in other issues in your city to demonstrate your commitment to the entire community.